Windsurfing is an awesome extreme sport to take part in and if you are serious about taking part in it over a longer term period you might want to purchase your own board to perfect your skills. Not only will this lower your lessons costs (as you won’t need to hire equipment) but using the same windsurfing board every time you practice can help you to improve your skills at a quicker rate. When purchasing a windsurfing board as a beginner you should be aware that bigger is better! Wider boards are much easier to balance on and can keep you motivated during the first few tricky lessons. 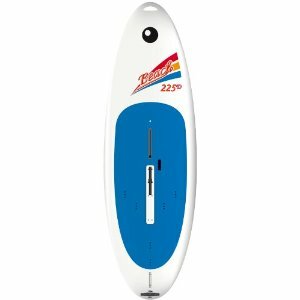 The Bic Beach 225D is a beginner’s windsurfing board and is ideally suited to heavier individuals. The board can handle a variety of different conditions and remain stable in the water making it the number one choice for a number of windsurfing schools throughout the United States. The Bic Beach 225D Windsurf board weighs 16.9 kg. The board measures 290cm x 90cm. The volume is 225 ltrs. The outer skin of the board is covered in polyethylene. A retractable dagger board system comes included. The Bic Beach 225D Windsurf board is especially made for beginners. It is easily maneuverable in the water and it provides a very high level of stability. The polyethylene outer layer increases the strength of the board and will easily hold the weight of heavier windsurfers. The shape of the board has been designed with a beginner in mind. The width of the board can help a newbie to the sport to feel stable on the water even in strong wind or wave conditions. If you are a beginner at the sport and want to learn or perfect some progression moves this is an ideal board for you. There are very few, if any bad reviews about this product. In fact when writing this review we couldn’t find a single one. Most people seem to find the board great for beginners and many have gone as far as to say it is one of the best on the market. The current price of the Bic Beach 225D is $899.95 on Amazon. This is more than affordable when compared to other windsurfing boards and it is the ideal board for a beginner to perfect their skills. Many people have continued to use the Bic 225D even after their skills improved. Since its release, the Bic Beach 225D windsurf board has been a popular product with both individuals who are new to the sport and windsurfing schools throughout the world who are in need of good boards to train their students. Beginners have struggled to find a suitable windsurfing board for years but it seems that things are now changing. The Bic Beach 225D has started a revolution! This entry was posted in Reviews, Water Sports, Wind Surfing and tagged Bic, Windsurf Board, Windsurfing. Bookmark the permalink.